Another reason for pie's improbable popularity is the crust. So many people struggle with pie crust. That's why I always start my pie recipes with the instruction to just make a crust happen, anyway you prefer to do that. Preheat the oven to 350 degrees F. Line two baking sheets or one magnum sheet with parchment paper. In a large bowl, combine flour, salt, baking powder, baking soda, cinnamon, ginger, and cloves, set aside. In your mixing bowl, whisk the brown sugar and oil together until combined. Add the chilled pumpkin puree and whisk to combine thoroughly. Add the eggs and vanilla. Add the flour to the pumpkin mixture a little at a time until completely combined. Using a large spoon, drop heaping tablespoons of the dough onto the prepared baking sheets, spaced evenly apart. Bake for 10 to 12 minutes, until a toothpick inserted into the center of a cookie comes out clean. Remove from the oven and let the cookies cool completely before adding the filling. Sift powdered sugar into a medium bowl and set aside. Add the confectioners’ sugar and vanilla and beat until smooth. Do not over-beat the filling. Spread filling between pumpkin cookies to make a sandwich and enjoy! This makes about two dozen pies, depending on how large you make them. These also freeze very well. 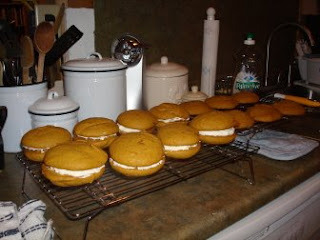 I was just mentioning to someone yesterday that I need to make a fresh batch of whoopie pies. For the filling, does it matter if the butter is unsalted? I tend to always have salted on hand. Kim~ I only use unsalted butter, so I do not know if it would make a difference. Anyone else have any clue on that one? Yum! I cannot wait to try these. Thank you so much for the recipe... I haven't met a Monica recipe I don't like! Let them eat cupcakes... there will be more pie for us! WAYYY past time for pie around here!